An arbour is an outdoor shaded seating area that is usually made out of latticed wood. They are similar in concept to pergolas except that arbours are typically smaller and open only on one side. One of the most striking features of outdoor arbour installations is how climbing plants and vines are allowed to grow over the wooden structure. This intermingling produces a unique composition—an accentuated style that will improve any outdoor area. Outdoor arbours are also useful for framing pathways and creating visual appeal above the ground level; they can also be integrated into deck designs. At Total Fence Inc., our talented craftsmen are also skilled arbour designers. We will gladly offer our services to help you find and create the best arbour installation for your yard or garden. The traditional: A traditional, three-sided latticed arbour surrounding a bench is a simple but effective way to add a relaxing space to a garden. Though small, these styles emit a “calm” atmosphere and can be used to create archways to focus attention and raise the eye. Extra style: Even when using a traditional wooden arbour as a baseline, many options are available. This includes trellis sides, pitched and felted roofs, sweeping wave shapes, or noble archways. Bold and bright colours: Most of the time, an arbour is either left in its natural wood colour or painted white. There is, however, a third option. Arbours can be painted solid, bold, bright colours like red or blue to turn the structure into a work of art. Foreign inspiration: Some people like to look abroad for ideas. Arbours can be crafted in styles that draw inspiration from Asian pagodas or even landmarks like the Arc de Triomphe. Integration with nature: Whether you want climbing vines, entwining flowers, or to have your arbour rising out of a hedge, the inclusion of plant life is an important part of any outdoor arbour installation. Our craftsmen can design arbours to best facilitate your desired integration. Wide material selection: The material used for your arbour is more than a budget matter. It affects the tone and style of your installation. Lattice wood is simple and supports climbing plants, while bamboo has more of a chic vibe to it. Modern images and large, bold arbours can be supported by timber, while natural, integrated works are accomplished best with brushwood. 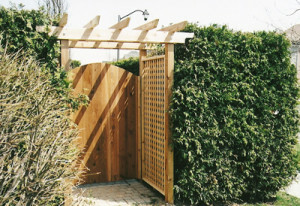 Total Fence Inc.’s arbour designers and contractor in toronto can produce original, beautiful craftsmanship to bring your vision of the perfect arbour to life. Click here to learn more about how we can design, build, and install the best wooden arbour for your garden. For a free quote or to book a consultation, contact us today.